The term "universal" is a community-coined term for building web apps that render happily on a server. 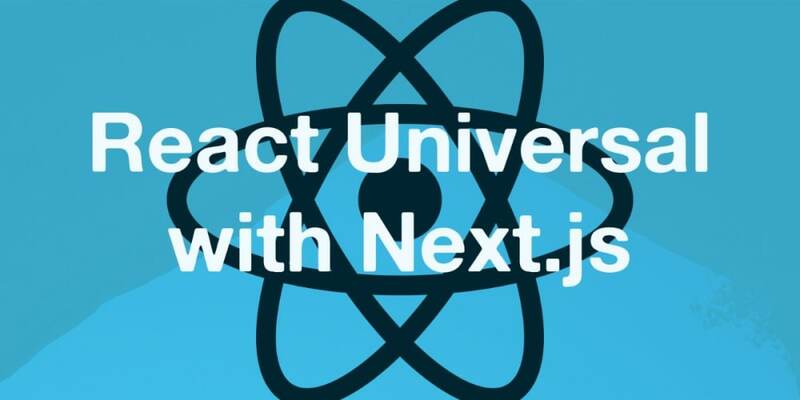 You might be familiar with "isomorphic" as well but the goal of this article is not to debate names; we are going to learn how to build server-rendered React apps with Next.js. We&apos;ve talked about building React server-side before. Today we&apos;ll discuss the topic more since it&apos;s an important one. React apps implement the virtual DOM ideology which is an abstraction of the real/original DOM. This abstraction is very useful to app performance because we can take a portion of the DOM, bind whatever data we need to bind, and insert back to the original DOM tree. This is in no way standardized and is just a concept that front-end frameworks utilize to make better user experience a true story. Just as every great thing comes with a price, Virtual DOM poses a problem. The original DOM which was received based on some information provided by the server has been lost. You might be wondering why that matters -- it does and we will see how. Things even get worst when you try to share your app on a social media platform like Facebook or Twitter. You are going to end up with an unexpected behavior because your actual content is not loaded on the server, it&apos;s just the entry point (probably the content of some index.html) that is. How do we tackle these problems? Universal apps are architected in such manner that your app renders both on the client and the server. In React&apos;s case, the virtual DOM is eventually dropped on the server as well as using some mechanisms that might give you headache if you don&apos;t choose the right tool. I have worked with few solutions but Next.js it is very promising. Next is inspired by the 7 Principles of Rich Applications. The idea is to have a good experience while using web app as well as building it. The experience should feel natural. Let&apos;s do something fun with Next.js together. We will use the Football Data API to build a simple small app that shows the Barclays Premier League ranking table. If that sounds like fun to you, then let&apos;s get started. I bet this was easier than you even expected. You have a running app in about 5 minutes that is server-rendered. We are making history! The Head component which is provided by Next is used to attach head to the DOM of a page. We just wrap the supposed head DOM content in Head Next component. We are using the axios library to carry out HTTP requests. The requests are asynchronous so we need a way to catch the response in the future when it is available. With async...await, we can actual handle the async request without having to use callbacks or chain promises. We can now bind the data to the rendered template by iterating over the standing property on the data and printing each of the standings. The class names are as a result of the Pure CSS style included in the head which is a very simple CSS library to get you started. This page displays dynamic content based on the query parameter. We receive the query from the getInitialProps and then use the id value to filter the data array from a given team based on their position on the table. The most interesting aspect of the above logic is that we are not requesting data more than once in the app&apos;s lifecycle. Once the server renders, we fetch the data and cache it with sessionStorage. Subsequent navigation will be based on the cached data. sessionStorage is preferred to localStorage because the data will not persist once the current window exits. The storage is done using componentDidMount and not getInitialProps because when getInitialProps is called, the browser is not prepared so sessionStorage is not known. For this reason, we need to wait for the browser and a good way to catch that is with componentDidMount React lifecycle method. getInitialProps is said to be isomorphic. You can define custom error pages by creating a _error.js page to handle 4** and 5** errors. Next already displays errors so if that is fine with you, then no need to create the new error page.